Member of the German Parliament. 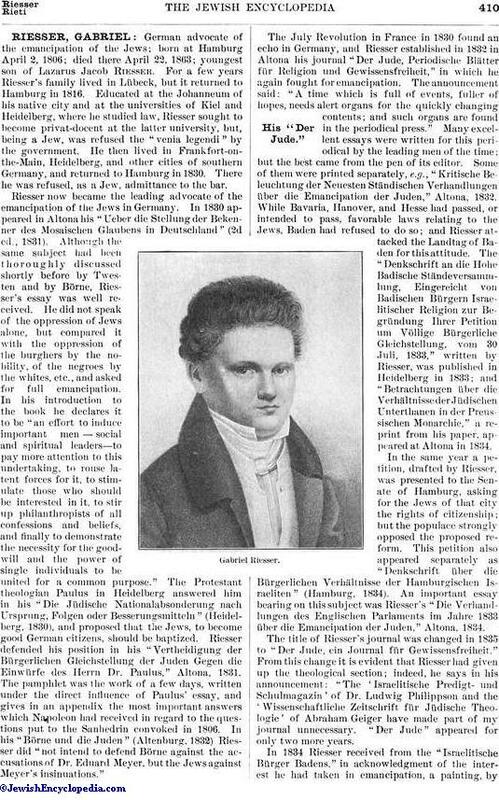 German advocate of the emancipation of the Jews; born at Hamburg April 2, 1806; died there April 22, 1863; youngest son of Lazarus Jacob Riesser. For a few years Riesser's family lived in Lübeck, but it returned to Hamburg in 1816. Educated at the Johanneum of his native city and at the universities of Kiel and Heidelberg, where he studied law, Riesser sought to become privat-docent at the latter university, but, being a Jew, was refused the "venia legendi" by the government. He then lived in Frankfort-on-the-Main, Heidelberg, and other cities of southern Germany, and returned to Hamburg in 1830. There he was refused, as a Jew, admittance to the bar. Riesser now became the leading advocate of the emancipation of the Jews in Germany. In 1830 appeared in Altona his "Ueber die Stellung der Bekenner des Mosaischen Glaubens in Deutschland" (2d ed., 1831). Although the same subject had been thoroughly discussed shortly before by Twesten and by Börne, Riesser's essay was well received. He did not speak of the oppression of Jews alone, but compared it with the oppression of the burghers by the nobility, of the negroes by the whites, etc., and asked for full emancipation. In his introduction to the book he declares it to be "an effort to induce important men—social and spiritual leaders—to pay more attention to this undertaking, to rouse latent forces for it, to stimulate those who should be interested in it, to stir up philanthropists of all confessions and beliefs, and finally to demonstrate the necessity for the goodwill and the power of single individuals to be united for a common purpose." The Protestant theologian Paulus in Heidelberg answered him in his "Die Jüdische Nationalabsonderung nach Ursprung, Folgen oder Besserungsmitteln" (Heidelberg, 1830), and proposed that the Jews, to become good German citizens, should be baptized. Riesser defended his position in his "Vertheidigung der Bürgerlichen Gleichstellung der Juden Gegen die Einwürfe des Herrn Dr. Paulus," Altona, 1831. The pamphlet was the work of a few days, written under the direct influence of Paulus' essay, and gives in an appendix the most important answers which Napoleon had received in regard to the questions put to the Sanhedrin convoked in 1806. In his "Börne und die Juden" (Altenburg, 1832) Riesser did "not intend to defend Börne against the accusations of Dr. Eduard Meyer, but the Jews against Meyer's insinuations." The July Revolution in France in 1830 found an echo in Germany, and Riesser established in 1832 in Altona his journal "Der Jude, Periodische Blätter für Religion und Gewissensfreiheit," in which he again fought for emancipation. The announcement said: "A time which is full of events, fuller of hopes, needs alert organs for the quickly changing contents; and such organs are found in the periodical press." Many excellent essays were written for this periodical by the leading men of the time; but the best came from the pen of its editor. Some of them were printed separately, e.g., "Kritische Beleuchtung der Neuesten Ständischen Verhandlungen über die Emancipation der Juden," Altona, 1832. While Bavaria, Hanover, and Hesse had passed, or intended to pass, favorable laws relating to the Jews, Baden had refused to do so; and Riesser attacked the Landtag of Baden for this attitude. The "Denkschrift an die Hohe Badische Ständeversammlung, Eingereicht von Badischen Bürgern Israelitischer Religion zur Begründung Ihrer Petition um Völlige Bürgerliche Gleichstellung, vom 30 Juli, 1833," written by Riesser, was published in Heidelberg in 1833; and "Betrachtungen über die Verhältnisse der Jüdischen Unterthanen in der Preussischen Monarchie," a reprint from his paper, appeared at Altona in 1834. In the same year a petition, drafted by Riesser, was presented to the Senate of Hamburg, asking for the Jews of that city the rights of citizenship; but the populace strongly opposed the proposed reform. This petition also appeared separately as "Denkschrift über die Bürgerlichen Verhältnisse der Hamburgischen Israeliten" (Hamburg, 1834). An important essay bearing on this subject was Riesser's "Die Verhandlungen des Englischen Parlaments im Jahre 1833 über die Emancipation der Juden," Altona, 1834. The title of Riesser's journal was changed in 1835 to "Der Jude, ein Journal für Gewissensfreiheit." From this change it is evident that Riesser had given up the theological section; indeed, he says in his announcement: "The 'Israelitische Predigt- und Schulmagazin' of Dr. Ludwig Philippson and the 'Wissenschaftliche Zeitschrift für Jüdische Theologie' of Abraham Geiger have made part of my journal unnecessary. "Der Jude" appeared for only two more years. In 1834 Riesser received from the "Israelitische Bürger Badens," in acknowledgment of the interest he had taken in emancipation, a painting, byOppenheim of Frankfort-on-the-Main, representing the return from the German War of Liberation of a Jewish soldier, whose face is seamed with scars, and who wears the decorations received for service. In 1836 Riesser left his native town and settled in Bockenheim, near Frankfort-on-the-Main, where he published his "Jüdische Briefe," Berlin, 1840-42. In 1843 he returned to Hamburg and was admitted to the bar there. The year 1848 brought changes in Germany, among them greater liberty for the Jews. Riesser was elected to the German Parliament ("Vor-Parlament") of Frankfort, from the district of Lauenburg. He belonged to the liberals, and was one of the vice-presidents of the assembly. On every possible occasion he spoke for his coreligionists. He was a member of the deputation sent by the Parliament to offer the crown of Germany to Frederick William IV. 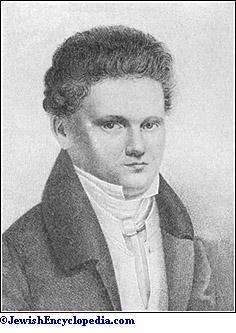 In 1850 he was elected to the German Parliament sitting at Erfurt, this time from Hamburg. 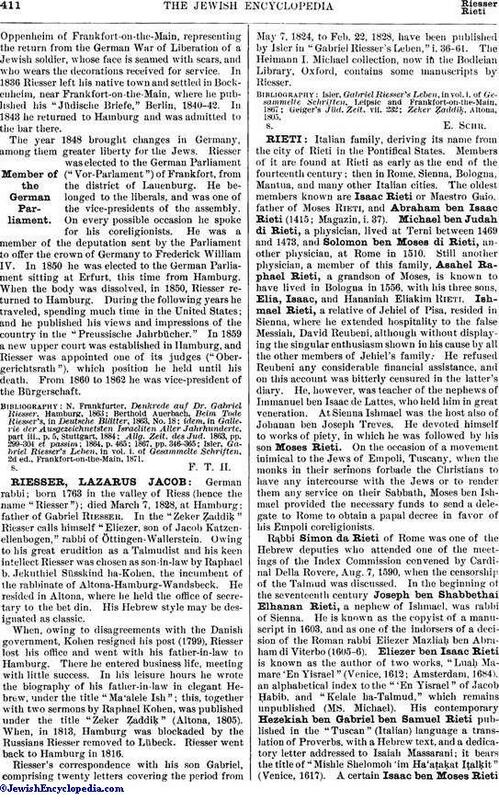 When the body was dissolved, in 1850, Riesser returned to Hamburg. During the following years he traveled, spending much time in the United States; and he published his views and impressions of the country in the "Preussische Jahrbücher." In 1859 a new upper court was established in Hamburg, and Riesser was appointed one of its judges ("Obergerichtsrath"), which position he held until his death. From 1860 to 1862 he was vice-president of the Bürgerschaft. Isler, Gabriel Riesser's Leben, in vol. i. of Gesammelte Schriften, 2d ed., Frankfort-on-the-Main, 1871.